Select File Save As File from the main menu. The dialog box in Figure 2.3 appears. Navigate to the Windows directory in which you want to save the data set. Type a valid Windows filename in the File name box. The recommended Windows directory in which to save your data is the personal files directory shown in Table 2.1. If you have many data sets, you can organize the data by making subdirectories of this directory. SAS/IML Studio provides easy navigation for loading files in this directory. Furthermore, the section Open a Client Data Set explains that this directory is automatically searched when you use a program to create a DataObject from a data set. 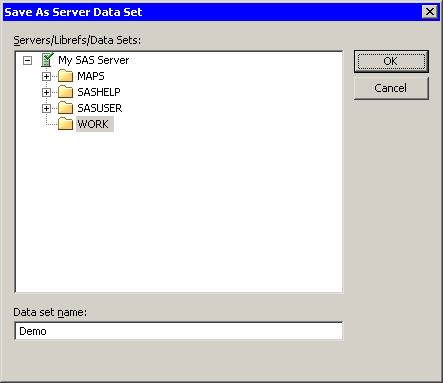 Select File Save As Server Data Set from the main menu. The dialog box in Figure 2.4 appears. 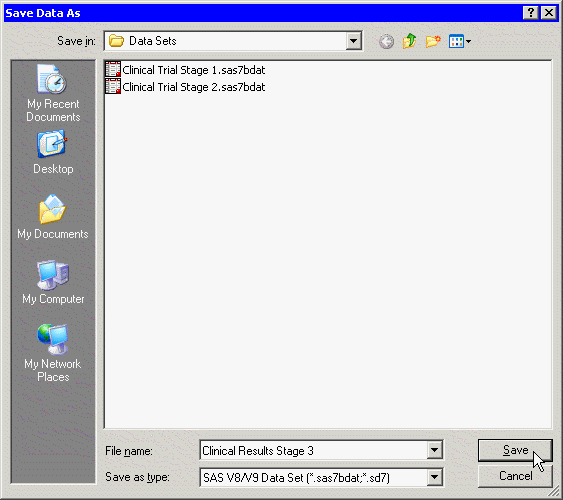 Type a valid SAS data set name in the Data set name box.